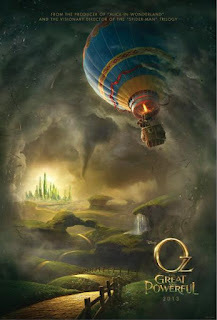 Ever since the first trailer for OZ: THE GREAT AND POWERFUL, I've been on the fence. The teaser looked too cheesy, and it gave off too much of an ALICE IN WONDERLAND vibe. However, my thoughts kept going back and forth because of the director, Sam Raimi, and the pretty solid cast. I'm still not completely sold on the film, but with the full trailer now online, I have a bit more faith than before. Again, it's the aesthetic of the universe that seems to be throwing me. I'm hoping that is just how the trailer translate, and it doesn't look as cartoony on the big screen. I'm more excited to see the performances than anything. If the script can hold up, then this could be a fun and fanciful film for the spring. OZ: THE GREAT AND POWERFUL will be released March 8, 2013, directed by Sam Raimi, and stars James Franco, Mila Kunis, Michelle Williams, Rachel Weisz, and Zach Braff.